This morning while driving in to work, I was behind a car that had a “Women for Obama” sticker on the back from the 2012 election. My first thought was how much I liked those logos: on brand, executed well, cohesive. However, my next thought was, why is that the typeface to represent or appeal to women? Designers make decisions like this all day long. What color communicates the brand best? What font will people in my target audience identify with? Which photographer’s style best goes with the theme of this ad/website? We have to communicate visually and we need our viewers to instantly identify with the visual cues we are using—we have a limited amount of eyeball time to get our message across. For example, the Noun Project‘s mission is to build “a global visual language that everyone can understand.” I use this site, along with Google, when researching for projects. I need to know what visual cues a majority of people associate with the subject matter I am trying to communicate—what shape suggests education? What colors do people associate with industrial trades? While designers are using what are already “established” visual cues, we are in turn perpetuating their use and solidifying it in the public’s mind. That’s fine for most things, but what happens when we get to more touchy subjects? What happens when we assume/poorly research these visual cues? What happens when those visual cues perpetuate untrue or harmful stereotypes? I am designing a small website targeted at the hispanic community in the United States. The client asked that I use images of hispanic families (a reflection of themselves) to make the site more welcoming. When you search for “hispanic family” on most stock photo sites, the results show a very specific looking type of person. However, I know that people who call themselves hispanic definitely do not all look this way and are a rainbow of skins tones, hair types, and facial structures. So what do I do? Ignore the client request and try to find an alternative to showing people and avoid it entirely? Use the quick and easy stock photo image and perpetuate the idea that everyone in this group looks this way? Or do I chance alienating my audience? What do I do if the client says “these people don’t look like the target group”? An unrelated site that I did not design has a section for their work with immigrants—they do not specify where these immigrants are from. The large image on that page is a brown hand resting on a chain link fence. I don’t need to go over my problem with this. 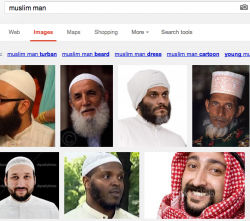 These examples don’t have the most harmful immediate consequences, but consider what happens when you search for “muslim man” in google images. Those image titles, keywords, and alt text didn’t come from nowhere on those images—and it eventually feeds into ignorant perceptions. 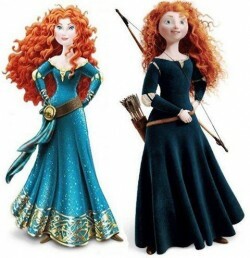 In more mainstream design, we get to the issues surrounding Disney’s alteration of Merida’s appearance to be more “princess-like” and, I assume, appeal to more young girls, in turn making more money. The artists (or more likely someone in marketing) assume little girls want to see more glitter, small waists, bigger breasts, and perfectly coiffed hair—these are their visual cues for princesses and beauty, and they have past sales numbers (and Bratz) to back this up. Even if this is true, should it be? This brings me back to the Women for Obama typeface. What does this typeface say about women? 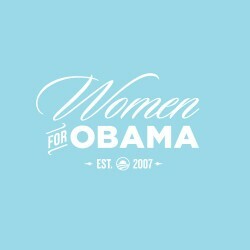 Compared to the other fonts in the Obama logos, it is slim, graceful, reserved, and yeah, I’ll say it, feminine. Personally, I was a “woman for Obama”, but I am none of those words used to describe the typeface. Especially not graceful—something that my gender role says I must be to conform to the ideal of femininity. I know a lot of people might think I am being overly sensitive about this, but I think we can all agree that our assigned gender roles seep in from every direction—it’s not just the toys we play with as children or the Abercrombie ads. We as designers need to consider more than whether or not people will interpret this visual cue the way we want. We have the power to affect people’s thinking, we need to consider whether or not what we are doing is right, even down to the tiniest details. Are the visual cues you are using perpetuating ideas that are wrong or harmful? As people that design the media that millions consume everyday, we have to stop being lazy about our communication and more thoughtful of our design’s impact. Great post, I agree. Ethical questions like this, and possible solutiosn, need to be discussed more often, when they come up, with each other and with clients when think there’s any chance our concerns will be heard. Nicely done. And at the risk of incurring wrath, a graceful argument, as well. Kudos. Aw, thanks Brock, that means a lot coming from an actual writer/journalist! You’ll be ready for my talk on Thursday (if you can make it), I can’t wait to hear your thoughts on all of this.